Many enterprises are already embracing DevOps to revolutionize the way they develop and deliver software to customers. But while the advantages are fairly obvious by now, DevOps does come with risks - risks that can be reduced or eliminated with the right application performance management (APM) tools and processes. This paper lists the top seven DevOps tips that high performing teams are following to maximize their DevOps efforts and investments. 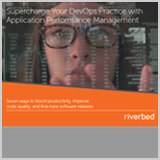 This ebook is for all of the teams and organizations that have been dipping their toes in the water and are now ready to take the plunge into all things DevOps.